Japanese Knotweed is one of the most aggressive invasive weeds in our region and is particularly destructive to native habitats along streams and rivers. This talk examines the ecological impact of the ongoing Japanese Knotweed invasion locally and regionally. It includes plant identification, modes of reproduction, the importance of mapping to identify stands, and will describe biological, preventive, mechanical and chemical control methods and other “best management practices”. 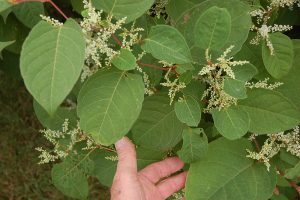 The 2018 survey of the river determined that knotweed management is still feasible but will require a coordinated effort by towns, land trusts, and private landowners to halt the spread and reduce its presence in the “Wild and Scenic” Housatonic River watershed. Tom Zetterstrom is a tree preservationist and fine arts photographer, noted for his Portraits of American Trees. His environmental activism spans nearly five decades from the early 1970’s. Since the 1990’s he has led campus arboretum design projects and Elm Watch preservation and restoration regional efforts, culminating with the elm grove at the National Conservation Training Center. Tom is the recipient of the 2011 Arbor Day Foundation’s Public Awareness of Trees Award and the 2013 Connecticut Urban Forest Council’s Ossenbrugen Award for efforts to “educate and promote positive change regarding trees and plants”. Since 2011 he has developed and lectured on transferable invasive plant management models that make native plant restoration possible. Tom has presented talks at the University of Minnesota, USDA FS Northern Research Station, Josh Billings National Historic Park, Baltimore Tree Trust, Connecticut Forest and Park Association and the Yale School of Forestry, etc.